TOKYO, Jan. 19, 2018 /PRNewswire/ — NISSIN Foods Holdings Co., Ltd. ("NISSIN," President and CEO: Koki Ando) announces its presenting sponsorship of EVO Japan 2018, the world’s biggest fighting game tournament series operated by "Evolution Championship Series" ("EVO"), and the first ever EVO tournament to be held in Asia. In recent years, competitive video games known as "eSports" have been on the rise with players competing for significant prize pots in tournaments held all around the world. 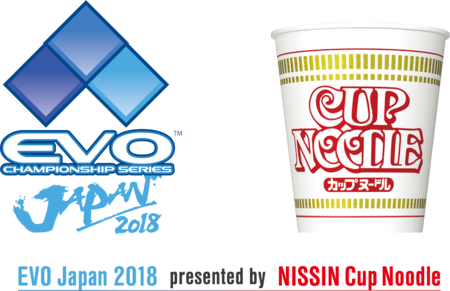 Now, NISSIN CUP NOODLE is proud to support the first ever EVO event to be held in Asia as the presenting sponsor of EVO Japan 2018. CUP NOODLE, the first instant noodles in a cup and invention of NISSIN’s founder Momofuku Ando, has long been loved by many eSports players as a quick, easy, and satisfying meal that helps them make the most of the free time they devote to refining their skills. The spirit of eSports players competing at the highest level of skill under fair rules resonates with NISSIN’s corporate slogan of "HUNGRY TO WIN," representing its strong will to persevere in the global market. Therefore, CUP NOODLE will strongly support EVO Japan 2018 and all its participating eSports players. Under the "HUNGRY TO WIN" slogan, NISSIN strives to develop sports marketing programs that inspire a challenging spirit through its support of pro athletes and world-class competitive tournaments. eSports are a new form of competition that transcends age, gender, language and nationality. No matter what one’s background is, we are on a level playing field. Through our presenting sponsorship, we strongly believe we can inspire the challenging spirit in all these competitors to help EVO Japan 2018 reach the pinnacle of eSports. We are delighted to join forces with NISSIN for EVO Championship Series in Japan. The EVO brand is internationally known as the world’s biggest stage for fighting game competition. Our proven track records make it the perfect partnership and we’re looking forward to working together for EVO Japan. Evolution Championship Series is the biggest and one of the longest-running fighting game tournaments in the world. Contestants of the tournament compete to become champion, through fair game play and competitive spirit, battling against rivals who gather from around the world. The spirit of the EVO Championship Series tournaments is not about just winning. It is one of the rare occasions where fighting game fans can share their passion and celebrate the community. Fighting game fans and rivals who spend their gaming lives can gather in one common place — giving new challengers an opportunity to meet fighting game veterans, while online friends and communities can unite together under one roof. EVO Japan 2018, the first ever EVO tournament to be held in Asia/Japan, will of course be held under the same philosophy as previous events. NISSIN Foods Group is the inventor and pioneer of instant noodles, and NISSIN Food Products Co. Ltd., the core company in the Japan market, holds the No.1 market share in Japan. Its founder, Momofuku Ando, invented the world’s first instant noodles, "Chicken Ramen," in 1958. While instant noodles have their roots in Japan, instant noodles today have grown to become an ‘Earth Food’ which is consumed at a rate of 100 billion servings annually throughout the globe. Following the invention of instant noodles, Ando developed the world’s first cup-type instant noodles, "CUP NOODLES," in 1971. CUP NOODLES are sold in over 80 countries in Asia as well as in the Americas, Europe, and other continents of the world. In order to revolutionize food culture around the world, NISSIN Foods Group as "EARTH FOOD CREATOR" is committed to pursuing the various possibilities of food that bring forth deliciousness with dreams. Moreover, through enriching mankind with the fun and joy that come from food, the company strives to serve society and the world at large.